From award-winning author Julie Berry comes a brand new middle-grade fantasy adventure full of humor and heart, exclusively from Audible. Maeve Merritt chafes at the rigid rules at her London boarding school for “Upright Young Ladies.” When punishment forces her to sort through the trash, she finds a sardine tin that houses a foul-tempered djinni with no intention of submitting to a schoolgirl as his master. Soon an orphan boy from the charitable home next door, a mysterious tall man in ginger whiskers, a disgruntled school worker, and a take-no-prisoners business tycoon are in hot pursuit of Maeve and her magical discovery. It’ll take all of her quick thinking and sass to set matters right. Maeve Merritt is one feisty heroine you won’t soon forget. Julie Berry lives near Los Angeles with her family. The Scandalous Sisterhood of Prickwillow Place is an Odyssey Honor Audiobook, and The Passion of Dolssa is a Printz Honor Title. ©2018 Julie Berry (P)2018 Audible Originals, LLC. Though I’m a middle aged woman I bought this book upon recommendation from a friend. I started listening yesterday to get my mind off current events. Wow! This book captured my attention from the very first words and I could have listened straight through if I didn’t have obligations. I finished it today and wish it wasn’t over. It’s a story about a genie and three wishes but nothing was predictable. There were twists and turns and some ups and downs in the protagonist’s journey (as any good tale has), but the ending was satisfying in every way. I think tomorrow I’ll buy another Audible title by Ms. Berry. Julie Berry has done it again, creating a middle-school fantasy book that is funny, full of exciting adventure, and heart-warming. Berry proves repeatedly that books aimed to young readers need not condescend to the reader. Her protagonist is young, but at no point did I feel like this book was trying to be written for young kids. Maeve Merritt is a fiesty British girl who is sent to a finishing school to help her learn to be an upright lady. She dreams of playing sports like the boys. She is quick to use her fists to solve her problems, and she feels fettered about the role that girls/ladies are allowed to play in her society. When Maeve finds a sardine tin that is home to a ill-mannered djinni, her adventures begin and she is soon joined by her roommate Alice, an orphan boy, and a number of other people trying to get her prize from her. Maeve is so likable--albeit so flawed. Her growth in this story is wonderful. At multiple points in the story, I thought Berry had turned British--from the descriptions of the foods they eat in the book, to the phrases they say, to historical references--this book is pure Brit. I assume a lot of research went into making her story so believable. 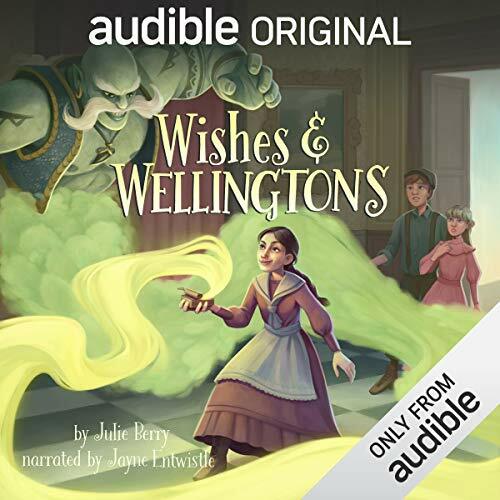 Wishes and Wellingtons is an audible original--meaning it was only produced as an audio book. There is no print version. The language is so delicious, as well as the names--"Miss Salamanca's Boarding School for Upright Young Ladies"-- it is such a pleasure to listen to the book's narration. Jayne Entwistle does a fabulous job as the narrator--she's narrated enough of Berry's books that the author/narrator seem like a natural pairing. Highly recommend for all readers young and old who enjoy an engaging fantasy story. This would also make a wonderful listen for a road trip--a story that will hook all ages. If you were a young girl who got blamed for everything under the sun, how would your outlook on the world be? Some things just can’t be helped. Berry shares the wonderful world of little Miss Maeve Merritt, the girl who doesn’t tolerate bullies. Everywhere she turns, it is something new that she is getting into trouble for. It seems, the girls at Ms. Salimanker’s School for Upright Young Ladies is absolutely not the best place for Maeve, although her parents will hear nothing of it. Berry captivates her readers with Maeve’s longing for adventure and the friends who she makes along the way. Miss Maeve Merritt seems to always be punished for something—even if she didn’t do it. Forced to sort through the trash as one of her punishments, she comes across a nice and shiny sardine can, one that appears to have not been tampered with. Opening the sardine can, Maeve expects to find a snack, but instead winds up with a djinni instead! This djinni; however, is foul and makes it clear that he is not happy with her, a little school girl, being his master. Knowing the lore of a djinni, supposedly being able to grant three wishes to their master, she makes her first wish. Revenge against a couple of the snotty, mean girls at the school. She wishes that their braids be turned green! When that wish backfires and she gets into trouble from a prank that they created, Maeve must think bigger than revenge, smarter too. She wants adventure, to fulfill her dreams of an all-girls Cricket team. But, in that dark alley sorting through trash, she is not the only one that stumbles upon the djinni. Someone else sees him too and has plans to steal it from Maeve for himself. As adventures come into the picture, so too do mysteries and mischief. The djinni warns Maeve that all of his masters before her always succumb to greed and end up becoming the very thing that they once said they would not become. Can Maeve protect her friends and fulfill her dreams all at the same time or will it end up changing her and making her life miserable? Berry has an incredible story with superb character development, an interesting take on middle grade fantasy, and is chalked full of originality. Since this review is complimenting the audiobook, it appears that the story is well-written from the voice relay. Entwistle’s narration is impeccable and enjoyable. The character vocalizations are all different and her relay is easy to follow. If you are a reader of middle grade and fantasy, you may want to pick up this book. Fair warning though, you may find yourself filling your bookshelves or electronic devices with more from this author. An audiobook was provided to Turning Another Page by Audiobookworm Promotions and in no way affects the honesty of this review. We provide a five-star rating to Wishes & Wellingtons by Julie Berry. I wasn’t sure I would enjoy this book as it isn’t the type of story I usually read, but I was pleasantly surprised by the quality of the characters, story and the narration performance. All around a great book! The narration could not be more perfect! This was such a wonderful story and what a secret little pleasure for an adult, having such a great story read to one. A delightful twist on the genie in the lamp tales. I enjoyed this story from the first moment to the last. The narrator delightfully acts as a properly feisty young lady in late 1800s England, a feminist before her time. Fun, interesting, and never a dull moment. She even stands her ground with a mean spirited bully of a genie that reluctantly grants her wishes. A wonderful listen for all ages! Loved this book! It's certainly for listeners of all ages, not just its target audience of young adults. Although I've been an avid reader for more than 40 years, I'm relatively new to listening and this is the first listen that I couldn't "put down", so to speak! I listened every chance I could get. I gave it 5 stars because I couldn't give it 4.5. 4 stars would be very unfair, 5 is much more fitting. Go ahead and get it. You won't be disappointed! A Gem of a Book! Absolutely clever and engaging, with many twists and turns, and some wise life's lessons as well. Highly recommended! I downloaded this story as one of the free monthly Audible offerings. I wanted a light, entertaining story and I was not disappointed. I enjoyed the overall story, the characters, the narration and the positivity of the theme. I am 58 and enjoyed every second of this wonderful tale. It was a fine break from my usual listens.